One of my fellow book bloggers, Peter, has been reading Shakespeare's The Taming of the Shrew for an upcoming book club meeting. First off, he had to go get himself a copy of the play, and agonised about whether to get it in the original, or one of the many versions created especially for study purposes. In the end, he bought one of each - the latter being a contemporary 'translation' of the original Elizabethan English. You can read his post and the accompanying comments here. As any of my regular readers will be well aware, my brain is a madly tangental beast, and while I'm currently embroiled in a couple of different Shakespeare plays, courtesy of my students, Peter's post didn't send me straight to Shakespeare, but more to the issues of reading him, and the discussions people have as a result. I'm working with sixteen year old boys and to date, we've covered Macbeth, King Henry, and Othello. My kids did Richard the Third and Macbeth. I often wonder why it's mostly the histories that are used as school texts when the comedies are so accessible - and that's coming more from the point of being someone who does read and enjoy Shakespeare plays. I had the good fortune to be taught by a lover of the Bard when I was at school, and she was able to imbue in me - if not the others in my classes - a love of the language, rather than the fear and loathing that seems to be so much part of many people's high school experiences. I've also been lucky enough to see a good many very clever live productions. The more recent movie versions of many of the plays have much to recommend them as well. In addition to that, because of my singing background, I've sung in two of the three Shakespeare-based Verdi operas and have seen the third - Otello, Macbeth and Falstaff respectively (the latter being based on The Merry Wives of Windsor). However, it was two things that really got me hooked on the plays - firstly, the comedies, none of which I'd read (although I've rectified that since), so my first exposure to them was in the theatre. I saw, in close succession, A Midsummer Night's Dream and Twelfth Night as modern productions and was both entranced and in stitches - particularly with Twelfth Night. I saw a wonderful production of The Taming of the Shrew in Canberra with a company of all male actors, as in Shakespeare's day, so the female parts were all in drag and it was just priceless. When I sang in Macbeth, it was on the school syllabus, so the opera company collaborated with a local theatre company to do a combined schools production on our set. We did bits of the opera - which was a very traditional setting - while the theatre company created a kind of Reader's Digest version of the entire play with mixed gender casting and a very modern interpretation of costuming and style. I sang Third Witch, and I'll never forget arriving for the first full dress rehearsal with the two other opera witches and coming face to face with the three witches from the theatre company. We were drab, ragged 10th century crones with great wooden staffs, and they were mad psychedelic Disney crossed with Witches of Eastwick! I'm not sure which of us was more stunned - we thought they were amazing and they thought we were awesome! The other layer to my Shakespeare experience is less straightforward, and I dare say, much more obscure, and probably not common to most of my readers - unless they're YA fans with a predilection for English boarding school books, AND have discovered Antonia Forest's Marlow books... 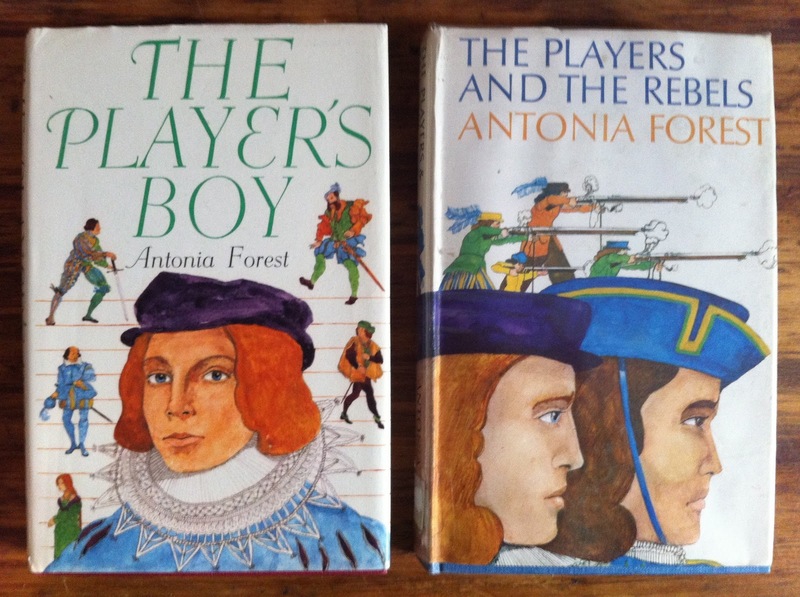 This post is by way of introducing Antonia Forest, as I'm about to re-read the pair of historical novels that she wrote alongside the main series, and I know that when I've done that I'll end up re-reading the main series again, because I love them. Look carefully upon the covers, folks, because they are the one and only edition ever to go to print and getting hold of them was a protracted and expensive business! They're set in Shakespeare's time, beginning in the English countryside with the central character, Nicholas (an ancestor of the family in the modern series), running away from his brother's home after being expelled from school. Picked up by Kit Marlowe (a contemporary of Shakespeare's) who offers to pass him off as a cousin, he is whisked away in the night. As things come to pass, Kit is killed in a drunken brawl, and Nicholas is conveyed to London by Robin Poley, who drops him at the walls of the estate of the Earl of Southampton - Kit Marlowe's patron - to convey the news of Kit's death. However, Poley is a government spy and blackmails Nicholas, telling him he is to communicate anything 'useful' to the government's cause to him, or risk his life... When Nicholas is offered a place in the Earl's household, where he has been met with kindness, he refuses, knowing that he represents a threat to them and himself if he remains there. In due course, having discovered the boy possesses both a fine voice and a prodigious ability to memorise anything on one sighting, the Earl finds him a place with his other poet...the other poet being none other than Will Shakespeare. The books cover a period of turbulent politics, during which the theatres were controlled by the government and plays were heavily vetted for possible treasonable content prior to being played. It includes the building of the Globe Theatre, and creates a wonderfully rich, beautifully researched - although fictionalised - account of the life of the company behind the plays. If you've read any histories of London of that time, you will recognise the scholarship in Forest's research. They are a wonderful read - for children and adults alike. This is one of the stand out features of this entire series - the modern books as well. Forest is a writer with a rare talent for elegant, witty prose that is, beyond any other characteristic, entirely believable. She has an outstanding ability to write wonderfully pithy dialogue that never fails to engage me, and there are particular conversations between characters that, despite man, many readings, still make me laugh and prompt me to read them out loud to whoever is in the vicinity. What she does with these two books, is bring Shakepeare's world alive and makes it real. The boys play the young women in his plays, and we get an inside look at the gender politics of the time that forbade women to appear on stage. Older women are played by the adults in the company. As it is a small group, people usually have to play more than one character in any given play - and you can just imagine Shakespeare pondering the logistics of characters exiting and entering as he wrote, having to take into account who was playing who and how long they'd have to change costumes in between. There is also the ever present issue of the boys themselves and how long Shakespeare had with any of them before their voices broke and they could no longer play women. This is also the time of Richard Burbage, the first to play any of Shakespeare's heroes, and revered in all the histories that mention him as the greatest actor of his time. Just in case you have never heard of it. Thought I would throw that in there for no other reason than the tenuous connection with the playwright in question. I wasn't aware of that film - although DB may be, as he likes Japanese film. I'll have to ask him. I'm sure there must be many more books and films where Shakespeare becomes a character of which I am unaware - if not spin offs from his plays. He's a huge resource, and all writers, the Bard himself included I am sure, are scavengers to one extent or another! !